ANS continues the fine tradition of featuring topics of particular current interest, but we also include articles generally relevant to the purposes of the journal. 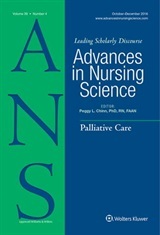 The purposes of ANS are to advance the development of nursing knowledge and to promote the integration of nursing philosophies, theories and research with practice. We expect high scholarly merit and encourage innovative, cutting edge ideas that challenge prior assumptions and that present new, intellectually challenging perspectives. We seek works that speak to global sustainability and that take an intersectional approach, recognizing class, color, sexual and gender identity, and other dimensions of human experience related to health. We welcome submission of manuscripts consistent with these purposes at any time, but if your scholarship is related to any of the planned featured topics, note the due dates below, and the description of what we seek related to these topics!